More of the Same….Oh Wait! After the Yankees went out and got 3 runs of Buehrle for a lead, CC soon gave back the lead, and I was immidiately thinking: this is more of the same. But wait! I spoke too soon! The Yankees came back, thanks to my man Melky, and CC held on and let the Yankees salvage the final game in Chicago. The Yankees won 8-5. The Yankees won! YAY! Pitching Analysis: CC Sabathia started yesterday. He had a pretty easy start, but his command was a bit off. He kept missing high and away with his fastball. Then in the 3rd, things got out of control. CC allowed 4 runs, thanks to homers by Dye and Thome, to let a 3 run lead slip away. That is when I threw my shoe at the tv. It was so frustrating. The Yankees managed 3 runs of Buehrle, and were looking good. Then CC gave it up in the “big inning” fashion like A.J. the day before. I couldn’t help but to throw my shoe. But CC managed to grind out the game into the 7th, settling down nicely. He gave up 5 runs on 10 hits, and didn’t walk a batter. He managed to keep the Yankees in the game, and even though it was not his best start, I consider it a good one since we won. Phil Hughes relieved CC in the 8th, getting 2 outs. Then Mo came on for the 4 out save, and nailed it down for his 30th of the year. Nice pitching, could’ve been better, but hey. We won. Defensive Analysis: The defense was much better yesterday. Great plays were being made all over the place. Especially in the first. New Yankee Jerry Hairston robbed Podsednik of a hit with a nice diving play at third. Then Melky stole a single from Dye by diving in front of him to make the catch. Hairston also made another nice play in the 3rd. I really like Hairston already. He is very versatile, and unlike Ransom, he is good everywhere. He can also handle the bat, unlike Ransom. And he can bunt and run well. He reminds me of a Clay Bellinger or Jose Viscaino of the championship teams, and that’s a good thing. He does all the little things right. Offensive Analysis: The Yanks got to Buehlre early (Ha! That rhymes!) in the 2nd and scored 3 runs, thank to my man Melky. He hit a 3-run homer on the first pitch! The Melkman Delivers! Melky made history at the plate. He hit for the cycle! Now we don’t have to hear Michael Kay say, “The last cycle hit by a Yankee was by Tony Fernandez in 1995.” He said that like every day! Now it will be Melky’s name. The last thing Melky got was the triple, in the 9th. I could not believe he did it! I am so proud of him! The Yankees had contributions all throughout the lineup. They banged out a total of 15 hits. But the key to yesterday’s win was that they were able to get the big hit when it really mattered. If they can do that, victory will be within their grasp. Yesterday’s win was a big boost for the Yankees. CC gave up the lead, but they came back and held it for the W. The heroes (Finally I get do to this!) are Melky Cabrera, for hitting for the cycle and making me proud, Jerry Hairston, for his really nice defense and his 2 timely hits, and CC, for although giving up the lead, holding it for the win. Sadly the Red Sox won, so the Yankees still have the tiny .5 game lead. The Red Sox come into town Thursday, and this may be the perfect time for the Yankees to get hot again. WE CAN DO IT, BOYS! I guess my fellow bloggers were right. Sometimes you just lose a game. I thought for sure game 2 would be a start of bad things for the Yanks, but last night they played the way I’m used to them playing: well. It was a great game, and the Yankees won 6-2 over the Rays. Pitching Analysis: Joba Chamberlain had the best start of his career last night. He went 8 innings of shutout ball, only giving up 3 hits and walking just 2, whie striking out 5. I am happy to eat my words about Joba. Before these past 3 good starts, I was very hard on him. I guess I expected him to be perfect everyday. But as Girardi said, he doesn’t have many innings under his belt. He is still learning how to pitch. I always liked Joba, but when he was pitching poorly I was beginning to think he was a fluke. Not anymore. I hope he stays a Yankee for his whole career. I think he saw the light and discovered what he was doing wrong. I know he will be dominant now. Brian Bruney came in to pitch the 9th since the Yanks had a big lead, and there is no other way of saying it: he really pitched badly. In previous outings when he gave up runs, he said he saw good things. It would be lying to say that there were good things last night. Bruney pitched just 1/3 of an inning, and allowed 2 runs. A leadoff triple to Crawford and a monster 2 run homer for Longoria. Then after a Zobrist pop out, Pena doubled. Bruney’s command just wasn’t there. He fell behind in the count to every hitter he faced. I feel bad for Bruney. Mo came in and inherited Bruney’s mess. He nailed down the final 2 outs, but did not get a save. It doesn’t matter. He saved the game anyway! Defensive Analysis: Like everything else, it was the polar opposite of game 2. The defense was incredible last night. Because Joba was pitching quickly and was on a roll, the defense was on its toes, ready to make every play. Pitching and defense. They go hand-in-hand. In the top of the third, Mark Teixeira made a fabulous play to rob Navarro of a hit. He hit a liner above Tex’s head, and Tex leapt like 5 feet into the air, extended his arm as far as humanly possible, and caught the ball! It was amazing. I love Tex. He is such a good player. Offensive Analysis: It was much better last night. In the 1st, Jeter lead off with a triple and scored on a single by Tex. I guess Jeter was mad about the previous game. There were a lot of homers last night. In the 6th, Cano was up. He fouled a ball right off his shin. The trainer came out to look at it, but Cano stayed in the game. 2 pitches later, Cano hit a monster home run. That eases the pain a little! Matsui double in the 8th, then Posada doubled, scoring pinch runner Ransom. In the 9th, my man Melky hit a home run for his 9th of the year. The Melkman delivered! I can’t get over how good of a year he is having. Then Tex hit his 26th homer of the year. I heard my Dad go “Whoa!” from the shower when Tex hit that one! It was quite a bomb. It all adds up to a 6-2 Yankee win. It was a comforting win for me. They paid me back for the bad game. But I learned from my fellow bloggers that even a bad game is better than no game. That is so true. I hate the offseason. I long and yearn for baseball; it is my life. But a good game is better than a bad game, and the heroes for last night’s good game are Joba, for the best start of his young career and Tex for his production with both the bat and the glove. The Red Sox lost to the A’s last night, so the Yankees have a ******** 3.5 GAME LEAD IN THE AL EAST!!!!! O TO THE M TO THE G!!!!! This is getting good! I LOVE YOU GUYS, NOW RUN AWAY WITH IT! 27 IN THE BRONX! HURRRAAAHHHH!!! After a tough loss to the A’s, the Yankees wasted no time in picking up another W. My fears about them going on a long losing streak are gone now. I think this team has a drive that I have not seen in years, and I know that they won’t have a long bad stretch. Anyway, Sergio Mitrre made his second start for the Yanks yesterday. Pitching Analysis: I thought Sergio Mitre was pretty good yesterday. The numbers don’t really show it, though. He went 5 innings, allowing 4 runs on 9 hits and stirking out 1. But, I think he did well for the following reasons: He did not walk a batter, he did get into a few jams but was composed enough to get his double plays to get out of them, and Joe Girardi gave him a very early hook. He only pitched 5 innings, but he only threw 74 pitches. I guess after Pettitte’s game Joe didn’t want to take any chances. Still I would’ve let Mitre go at least 6. Mitre gave up 2 runs in the first, but had an easy 2nd and a 3rd of only 4 pitches! In the 4th with 1st and 3rd with no one out, Mark Ellis hit a sac fly. After a misplay on a double play ball, Mitre does get a beautifully turned 6-4-3 double play to end the inning and the threat. In the 5th, Orlando Cabrera (the annoying guy of the series) leadoff with a single, and Mitre followed by getting a 6-4-3 double play, his 3rd double play of the day. After allowing a single to Kurt Suzuki to leadoff the 6th, Girardi pulled Mitre for Coke, who gave up the lead with a 2-run homer for Ellis. Mitre couldn’t get a win. Hughes pitches the 7th and as always was invincible, but in the 8th he ran into trouble. He got into a 2nd and 3rd 1 out jam, and Girardi called on Bruney to get 1 out. I was screaming at the TV when he did this. But despite his late struggles, Bruney got Mark Ellis to strike out. Yes! Then Mo came in for a 4 out save, and of course he got it! Overall, nice pitching. The pitchers were tough when they faced a jam, and for the most part got through the jams. Defensive Analysis: The Yankees made Mitre’s outing better by fielding all his grounders well. The 3 double plays they turned were a great help to Mitre. Although a double play was booted, it did not matter because in the play after it they got the double play. The defense was solid yesterday. Offensive Analysis: Everyone in the Yankees lineup got at least 1 hit yesterday. Jeter at the top and Ransom and Melky at the bottom contributed a lot yesterday. After Mitre gave up 2 in the first, the Yankees bounced back with 4 in the bottom half of the inning, thanks to a huge bases clearing double by Cano, who usually struggles in those situations. In the bottom of the 6th, Melky walked and Ransom doubled, and the Yankees had 2nd and 3d with 1 out. The Yankees had the same guys on base in the same scenario in the 4th, but failed to push a run across. Not this time. Jeter single in 2 runs, and Tex singled in Damon later on. The Yankees got contributions from everyone in their lineup yesterday, and got the big hit enough times to win. The pitching and defense were solid enough for the win as well. What more could we ask for? The heroes for yesterday’s win were Derek Jeter for his go-ahead single, Robbie Cano for his clutch double in the first, and Brian Bruney. Although he only got 1 out, it was a huge out that put the ball in the hands of the greatest closer in baseball. And it was a huge out for his confidence. Great game yesterday. The Sox lost, so the Yankees regained the game they lost the other day. The Yankees have a tough road trip ahead of them, but they look to continue their hot streak and push away the Red Sox even more. Go Yanks! Last night was another victory for the Yankees, and another loss for the Red Sox. Now the Yankees are in sole possession of first place! The Yankees beat the Orioles last night by the score of 6-4. Sergio Mitre made his Yankee debut last night and did well, which is good because he is going to stay here for a long time since Wang had a setback with his injury. Pitching Analysis: Sergio Mitre pitched 5 & 2/3 innings while allowing 4 runs, 3 which were earned, and striking out 4. Mitre surrendered a run in the first, probably a bit nervous in front of a large crowd in Yankee Stadium for the first time. He settled down in the second, and gave up a hit but nothing else. He had a little trouble holding on baserunners. But Brian Roberts is not your average baserunner. In the top of the third, Roberts led of with a single and then stole second. As Roberts is doing his customary dance off second, Mitre has him picked off, and throws to Cano, who boots the ball. Roberts wound up at third. With no one out, Adam Jones grounded out, scoring Roberts. I’m sure Mitre didn’t want to give up the run, but I know he was glad to have Roberts off the basepaths! He got out of the inning wihtout any more trouble. Mitre then had a nice 12 pitch 1-2-3 4th, and a quick 5th with the help of a 6-4-3 double play to end the inning. In the 6th, Markakis led off with a single, followed by a single from Huff. Luke Scott then grounded out to Tex, and the runners advanced. With second and third and 1 out, Mitre surrendered a 2 run single to Melvin Mora, bringing the score to 6-4 Yanks. He then got Nolan Reimold to strike out. On that positive note, Girardi pulled out Mitre, who got a very nice hand, and brought in Aceves who got Wieters to pop up for out number 3. Aceves pitched the 7th also, and Coke pitched the 8th. Mariano nailed down his 27th save of the year. Nice pitching today. I’m proud of Mitre for throwing strikes, inducing double plays when he had to, and for giving a solid start to give the Yankees the chance to win. Nice job! Defensive Analysis: It was pretty solid, accept for Cano booting the pickoff throw. The Yankees turned some nice double plays, and Cano was the centerpiece of many, making up fot that misplay. There was a really nice double play in the top of the 8th where there was a sharp liner hit right at Tex, who then stepped on first to double up Markakis. He is so smooth at first! Offensive Analysis: There were more runs last night. I liked how the Yankees scored their runs in many different ways: a homer, sac fly, and a clutch single. In the bottom of the second, Arod built a run for the Yankees. He led off with a walk, then stole second, moved to third on a fly to right by Posada, and scored on a sac fly by Swish to tie the score at 1. They didn’t get a hit that inning, but they got a run! In the bottom of the 3rd, Cody Ransom walked with 1 out. With Jeter up, they did a run-and-hit, and Jeter singled, moving Ransom to third. Then on the first pitch to Damon, Jeter stole second. Damon made out and then Tex walked. With the bases loaded and 2 out, Arod proved he is clutch again, and singled to left bring 2 runs home and giving the Yankees a 3-2 lead. In the bottom of the 4th, Swisher lead off with a walk, and Cano hit a monster 2 run homer into the Yankee bullpen in right. After Melky grounded out, Ransom walked and stole second, Jeter walked, and Damon singled to drive Ransom home. The Yankees played very well last night. I liked how they were aggresive on the basepaths. I wish Joe Girardi would do that every night. The Yankees have a lot of guys who can run. Anyway, the heroes last night were Sergio Mitre for having a successful debut and picking up his first win as a Yankee, Robinson Cano for his homer, and the Texas Rangers for beating the Red Sox and helping us get into first place! Thanks Rangers! We love you! Yesterday, the Yankees beat the Tigers for the three game sweep, the second game in a row with the score 2-1. They did it with good pitching, and timely homers from their big sluggers. Pitching Analysis: Joba Chamberlain was fantastic yesterday. I was wrong, and I admit it. I never thought he would pitch so well yesterday, coming off two bad starts against the Angels and Mariners, and because he had 9 days off! I’m glad I was wrong! In the first inning, Joba struggled a bit. He got himself into a first and second jam with 1 out thanks to Polanco and Cabrera, but came out of the inning without giving up a run due to a Clete Thomas stirkeout. But it took 23 pitches to do so. In the top of the third, Joba gave up a leadoff walk to Granderson. Granderson tried to steal second, and Posada flung the ball into centerfield, allowing Granderson to advance to third. This made me go on a rant about how the Yankees need Cervelli. (A lot of things make me do that! I love that man!) I was also thinking Joba would get all freaked out and give up a bunch of runs, like that time Ransom made an error and Joba gave up like 5 unearned runs. But this time, Joba managed to get out of the inning without giving up anything! WOW! In the top of the 4th, Clete Thomas hit a monster solo shot into the right field bleachers. But Joba remained composed and did not let it go to his head. He got out of that inning having given up just that run. The top of the 5th was the biggest jam for Joba. Granderson hit a hot-shot to Swisher, who let the ball go through his legs, and Granderson wound up at third. Then he plunks Polanco later on. Unbelievably, Joba struck out Marcus Thames with a 97 mph fastball to get out of the jam without giving up any runs! Again! Joba pitched 6 & 2/3 innings of 1 run ball. Job well done for Joba! The bullpen yesterday, the “Philthies” Phil Coke and Phil Hughes did great. And Mo closed out the series with his 26th save of the year. Defensive Analysis: A few stupid plays happened, like Jorge throwing the ball into center and Swish letting a tough hop get by him, but it didn’t cost anything. Overall, solid yesterday. Offensive Analysis: Not much yesterday; Jackson pithced very well. There were only 5 hits, and 2 worth mentioning. In the bottom of the 4th, Arod hit a solo bomb that tied the game at one. Then in the bottom of the 6th, Big Tex launched a ball into the Teixeira’s Terrace in right to give the Yanks a lead that they never relinquished. Tex and Arod made up 80% of the Yankees hits, both going 2 for 4. Posada got the other hit, a nice double. The heroes yesterday were Joba, Tex and Arod, and the Philthies. It is so great that the Yankees were able to sweep this series where all the games were close. Good pitching like the Tigers have is like what we may see in the postseason, and it is good to know the Yankees can handle it. And best of all, with the Red Sox loss, now the Yankees are 1 game out! Go get’m boys! Make me proud! Tomorrow, July 18th is Ramiro Pena’s 24th birthday. I feel bad that he is celebrating it in Scranton. I’m sure that parties are better in NYC! Ramiro played very well in his short 46 games as a Yankee, batting .267 with 23 hits, many which came in clutch situations. He also played very well defensively at third and short. I was very disappointed when he was sent down. Girardi said he needs to learn to play the outfield and that he will be back soon. I hope he does come back and they don’t be stupid and trade him. Ramiro said that he idolized Jeter, and he may be the Jeter of the future if the Yankeed be smart and keep him. Sometimes I don’t understand the moves the Yankees make. I know they moved Pena to make room for Hinske, but why is Ransom the utility man? No offense, but he cannot catch the ball and is not to swift with the bat. I think that New York is too much pressure for Cody Ransom and I think he should be traded. 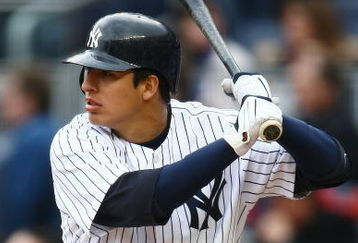 Ramiro Pena should be the super utility man for the Yankees. I think this is what they are going to do since he is learning to play the outfield. Well, hopefully Ramiro Pena is in the Bronx in Sepember, and next July, he can have a special New York City birthday party! Isn’t Ramiro adorable? I sure think so!